SP PNG Hunter Mark Mexico has been signed by Australian NRL club the Cronulla Sharks and will link with his new club immediately. Mexico, a World Cup Kumul front rower, has signed a one-year contract with the option of an extended contract based on his performances at his new club this season. Having just returned from minor knee surgery Mexico played his third game back in the SP PNG Hunters’loss against the Ipswich Jets on Sunday. Agreeing to the terms offered by the Sharks, Mexico was in a menacing mood with some great charges up the middle against the Jets. 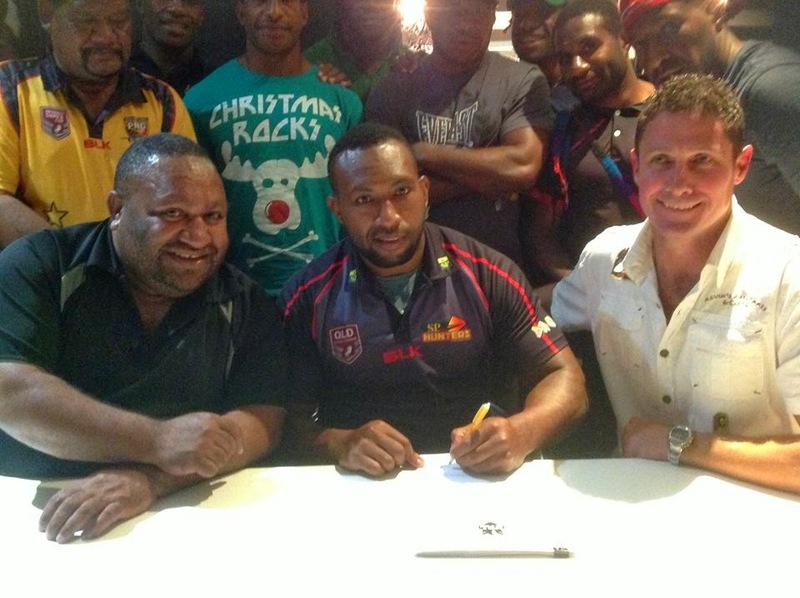 Mexico’s signing follows on from another Hunter and Kumul player Wellington Albert’s engagement with NRL club the Penrith Panthers early this year. The Cronulla Sharks needed a big forward with a solid work rate and Mexico although untried on the NRL scene will be jumping out of his skin to prove his worth on the big stage. PNGRFL CEO Brad Tassell, who was at the centre of the negotiations for both players to ensure the welfare of the players is protected, said it was a deal that gives Mexico the opportunity to play top flight football and expose his talent against the best players in the world. “It’s a great opportunity for Mark and I know he will grab it with both hands. We have a system put in place where we provide advice and guidance to the players and that includes a recommended player agent in Steve Deacon. What we don’t want and the PNGRFL Board has been very specific about this is several different agents approaching players direct with false promises when they don’t know or understand the culture. This is all new to PNG players and we want to ensure they are given the right advice and guidance. This is simply to look after their interests and so the club knows what is going on with the players, so it doesn’t affect their performances. Steve is on the NRL Accreditation committee for Player Agents and knows the system inside and out. He knows what clubs are looking for and what type of player they may need at different stages of the season. Mark is a perfect example where he had a couple of clubs interested, but Cronulla who recently lost Gallen and have contract issues with Fifita needed a quality prop so Steve approached them and a firm offer was made.